Synopsis: A routine military exercise turns into a nightmare in the Scotland wilderness. Quick Review: Ever since I watched The Descent, I’ve always wanted to catch up on Dog Soldiers, Neil Marshall’s first effort. Now that I’ve seen it I’m kicking myself for not having watched it earlier. Dog Soldiers is one of the best werewolf movie of all time, period. Maybe only second to “An american Werewolf in London”. Right from the start there is a sense of urgency and hopelessness that grips you until the very end. Director Neil Marshall succeeds to keep our attention on a tight budget with only 2 main location throughout the movie. It starts as a military movie, with a great cast of characters by the way, and turns into “Night of the Living Werewolf” with our heroes locked into a house trying to protect themselves from their assaillants. 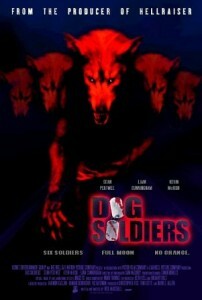 I loved everything about Dog Soldiers: the dialog sounds real (some local slang might be difficult to catch if you’re not used to it) and is, at times, hilarious, each actor does a good job at making us empathize with them, the editing is great and the script, while quite straight forward, is tight enough with no time wasted om overstretched scenes. When watching Dog Soldiers, I understood better why The Descent was such a blast of a movie. Neil Marshall is, in my book, one of the best action-horror director working right now and he proved it again with Doomsday and the episodes he directed for Game of Thrones. Now I need to catch up with his last movie, Centurion. Click Here to Watch Dog Soldiers Online Now!